The Architect's Newspaper blog recently featured the work of faculty member and alumna Tamar Zinguer's class at Cooper Union, where students create "playful constructions"—applying architectural principles to a tangible scale. “How can a construction toy be ‘playful’?” This is the problem that Tamar Zinguer asked her Cooper Union students in a recent seminar focused on the architecture of play. For this session, Zinguer, who has taught the course before, decided to eliminate the visual aspect, a sensory aspect of toy design highly relied upon in previous seminars’ constructions. Focusing less on color and more on the experience of the object, the result is a set of innovative and wonderfully textured toys, from blocks to shells, that encourage play for the visually impaired. 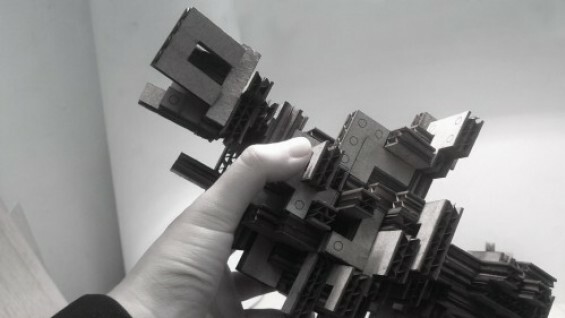 The project required that students to debate the meaning of architectural toys and critique each other’s theories and study models. Through various case studies students were able to understand the evolution of these specific concepts of play and begin their process of invention.